Galax, Low Gap, NC, Surry County, June 1949, photo taken by John Hemmer. Truman N. Woodruff, who operated T. N. Woodruff and Company in Lowgap, NC, sold galax leaves to florists in New York City, starting in 1907. 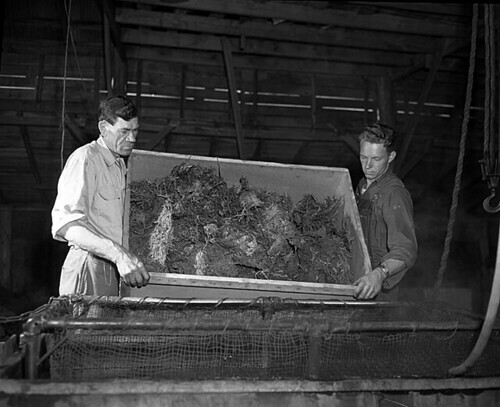 He hired local women to pick the galax, sort it, and bundle it for shipping. A woman could pick as many as 10,000 leaves in a day. From the North Carolina Conservation and Development Department, Travel and Tourism Division photo files, North Carolina State Archives, Raleigh, NC.